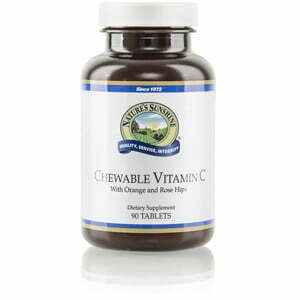 Nature’s Sunshine Vitamin C Chewables provide 410 percent of the recommended daily value of vitamin C. This all-natural, antioxidant packed wafer, made from real orange juice, rose hips, and natural citrus flavor, protects the body from free radical damage. 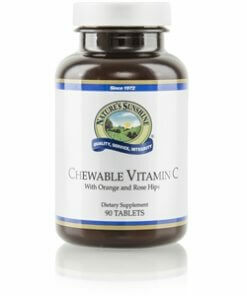 Vitamin C Chewables support a healthy immune system and collagen development. Designed to meet the highest quality standards, this product is kept fresh and moisture free with small dehydrated particles and is sweetened with natural corn-derived fructose and natural citrus. Instructions: Adults: Chew two tablets with a meal twice daily. Children: Chew one tablet with a meal twice daily. Fructose, sorbitol, freeze dried orange juice, stearic acid (vegetable), xylitol, Rose Hips fruit (Rosa canina), magnesium stearate (vegetable), silicon dioxide, natural orange flavor, and natural lemon-lime flavor. Contains no artificial flavors or colors, or sucrose.